It’s Technically Tuesday | What's So Funny! Continuing my struggle to do a “new post every Tuesday,” I realize my idea of Tuesday may be different from the rest of the world. As a night owl, generally I am the most productive after the world sets its sights on sleep. That is, if I’m being productive. I define Tuesday (or any day) as from the time I wake up to the time I go to bed. So I may go to bed 3am on Wednesday morning; that still counts as my Tuesday. Today, I walked through the woods and encountered the tree that fell across the path a couple of months ago. 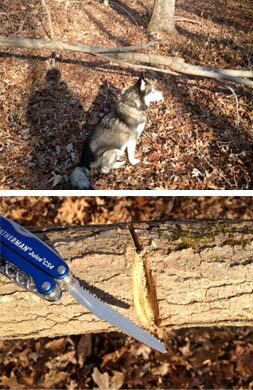 Then, I had started to cut through it with my Leatherman’s saw, but it was slow going so I figured I’d come back to it and do a bit more. I don’t travel that route with the dog much, but today, I passed by it and took out a few minutes again. And next time I come by, if I have my knife, I will again. Maybe Nature will help me out with some termites. Until it’s done. And this is how I hope to write my novel. I realize I have a novel to write and I’m not moving forward on it, and I have a blog which needs content, I have decided to “pet two kittens with the same hand” (my vegetarian peacenik wife doesn’t like that expression about the birds and the stone) and thusly move forth and do a twenty-minute writing exercise here. It may or may not end up in the book. The glow of the candles in front of the tavern beckoned Bimo up the path. The twilight added weight to his eyelids and feet. Thusly, he dragged his rope and his rumbling stomach that much further from Framstadt. With his purse empty, he had no idea how to pay for a meal and a bed, but this was the place to find them. The music and laughter warmed his soul. Two figures sat at a table outside the door, drinking and arguing. One silhouetted hand tossed a small crust of bread to the ground. Bimo rushed as quietly as he could to pick it up. Reaching under the table, he found a handful of dirt. He pawed around and found it, surrounded by fur and a cold, wet snout. The dog’s low growl put a chill down his spine. He drew his hand away, now wide awake. And dressed in a fern. A mountain of muscles, leather and dirt (but few teeth) stretched skyward, and the table was thrust aside by an immense tree-trunk thigh. “What for ye takin’ ma dog’s food?” boomed his greasy, crumbed, hairy orifice. He lunged down toward Bimo’s neck, who rolled backward into a handstand. Dungle stopped in his tracks. “Right away, wood spirit!” Dungle and his friend rushed toward the door. They went in. Bimo came down from his handstand. He cautiously put his ear to the door as he rubbed his shoulders. He could hold a handstand for just over five minutes on a good day, and today, he was tired. Inside, he heard laughter. The music stopped suddenly. The sound of fist on flesh and the sound of a body hitting the floor. Footsteps. Many footsteps. Bimo rushed back to his handstand. The door opened and a crowd of people rushed out. “Here ‘e is,” boomed Dungle, “like I told ye — the upside-down wood spirit!” Out rushed the tavern keeper, the musicians, three whores, townspeople and a few traveling merchants, all eager to see the wood spirit. A hushed circle formed around Bimo, whose fingers strained to keep himself erect. And that was 20 minutes. Plus some extra time for research, a stop or two by Thesaurus.com, dreaming, and editing-as-I-go. Not much, but the wheels have moved, just slightly out of the mud. What are you trying to get done that is a daunting task? You think you can sit down now and put in 20 minutes, to the exclusion of other distractions? Or ten? Or five? One step forward is one step further. No steps is no steps. A writing rate of 20 minutes a week may take 10 years to get the book written, but it’s a start. And maybe Nature will step in and help me along with random firings of the brain.